The circuit given here is of a 2 x 32 Watt stereo amplifier using the famous TDA2050V IC from ST Microelectronics. The TDA2050V is an integrated monolithic 32 watt class AB audio amplifier IC available in the Pentawatt package. The IC has lot of good features like low distortion, short circuit protection, thermal shut down etc. Two TDA2050V ICs are used here, one for each channel. For each channel the input audio signal is fed to the non-inverting input of the IC through 1uF (Non-Polarized electrolytic) capacitor and this capacitor performs the job of DC decoupling. The ratio of the 22K and 680 ohm resistors determine the gain of each channel. The network comprising of 2.2 ohm resistor and the 0.47uF capacitor connected between the output of the amplifier and ground forms a Zobel network which represents the impedance of the speaker appear as a steady resistive load to the amplifier output and this dramatically increases the high frequency response. Assemble this circuit on a good quality PCB. Use 18V DC dual power supply for powering the circuit. Fit the ICs with adequate heat sinks. Connecting 10K POTs at input lines will serve as a volume control. For full output power the circuit require 200mVpp RMS input. pls sir can i combine the two amplifier together so that i can be able to get the sound that i need. And again, is there anyway u can apply the this circuit an equalizer so that it will have different section of volumes. I will be so much glad if may request will be answered. Thanks and God bless u.
if i use bridge mode amplifier then its output wattage will be increase or not. Plz help me sir. Iam waiting for ur replay. Thank you. .If i use this ckt on a bridge mode how much volt need to run this amp.? Please answer me sir..
With 12-0-12 transformer with 4 rectifiers and two filter capacitor you will get +/- 16.8 volts DC. with this the amplifier will deliver 30 watts into 4 ohms load with a distortion fig of 10%. at 0.5% distortion it will be 23 watts. Your transformer should be rated for minimum of 50VA. In the bridged mode operation it will deliver 62 watts into 8 0hms load at 0.5% distortion. your transformer should be rated for 100 VA rating. 4 ohms speaker for bridged operation not recommended with TDA2050. Hello sir I was wondering what kind of plugs I would need to connect to this device. I was wondering if I had to use a RCA plug for the input and output ( total 4 ? ) hope you can help! For input use RCA phono plugs. for speaker output use a different connector to avoid confusions. use screw type binding strips or use push to lock wire type terminals (used for surround speaker connection of TVs amps etc). Hi Rex it should be 250mV RMS or 720mV pk-pk approx for the rated output as the amplifier gain is just 33.5. and supply voltage is minus plus 18 volt it can just produce 18 watts RMS into 4 ohms load. But data specifies a -3dB power bandwidth is 200mV RMS input. Hello sir, I m new in elertronic field,so i have not big or deep knowledge about it. Can u tell us which one amplifier is best sound output tda2050 or lm4440. I m so confused which one we use. Hi Subhendu input to C1 a 1K ohm resistance in series. Add a 470PF ceramic disc capacitor in parallel with R1 should take care. Provide the same for the other channel also. Sir, I have little confusion , in this circuit capacitor C6 and C12 – their positive terminal are connected with -VCC and negative terminal with GND but i found in other circuit positive terminal with GND. So what is correct connection ? Hi Ranjit the IC1 circuit is correct only mistake is C6 polarity to be interchanged. Incorporate the same for IC2 also. Sir what should be the current rating of the power supply that is to be used for this circuit???? How can I connect the 3 pins of a 10k pot. to use it as a volume control????? Sir Iam using 3inch 30 watt speakers are they suitable for the circuit???? You can use 3 inch 30 watts 4 ohms speaker most suitable you may have to fix your speaker in a suitable bass reflex enclosure. veiw from shaft side the control with all the 3 pins are at the top, left is hot signal point(signal from external source), center to the amplifier Pin1 through capacitor and right to ground/common. Sir,can you plz. tell how to use single pot for volume control?? the same circuit of TDA2030 can be used increase the supply voltage to +20volt -0- -20Volt DC. 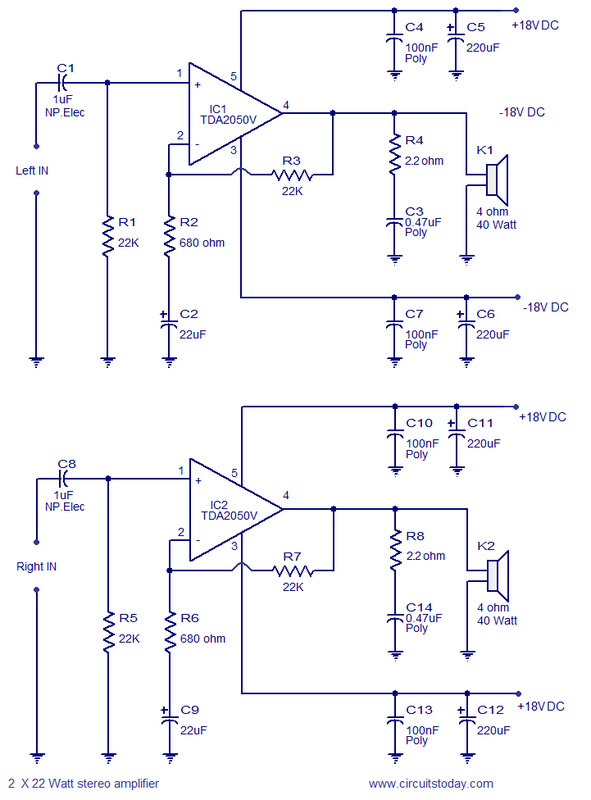 sir please help me I want to use this circuit for subwoofer how can I use it?????? Can I use a low pass filter?????? if yes then please provide me the circuit diagram…. Sir I have another doubt can I feed the output of one amp. to the input of other channel to get double wattage i.e instead of 32 watt can I get 64 watt from this circuit??? Hi Pankaj you can use 12-0-12 5amp transformer but ensure that you use 2 amp fast blow fuse in both positive and negative rail, in the the event of speaker lead short, to protect the IC. voltage is the criteria but not the current if it is capable of around 2to 3Amp ok for mono and 4 to 5 amp for stereo. still use fast blow fuses for both the channels seperately. sir can I use 12-0-12 5 ampere transformer???? sir i am using 18 0 18 5A tansformer…. can I use 12-0-12 s ampere transformer???? Sir Iam using +/-18 volt 5 amp. power supply is it fine or I should use another with lower current rating???? hello sir I had done what you told me to do but my tda2050v get heated and burned and when I replace it with new one then the speakers are making burr….. sound on power on and continues like this…..
Hi Pankaj it looks like metallic sound (tinny sound). Between C1 and R1 add a 1K resistance connect a 470PF capacitor in parallel to R1. Repeat the same for the other channel also. This should solve your problem. thanks sir but my circuit is having one more issue it is producing some more unwanted sounds like we are rubbing some 2 metals each other and it is very loud please help me sir in solving my problem..
sir there is an another -18 volt shown in the circuit first amp. circuit and in second one both the terminals have +18 v.
and how can I add bass and trible controls in the circuit. Hi Faraday you can use TDA2002 push pull amplifier with 12volt with 2 ohms speaker it will deliver >25watts. pl refer the datasheet. Sir, please I need a high power sub-woofer circuit diagram for that operates on 12 volt. Both IC and Transistor types. Hope to hear from you soon. Good Day. Sir, please a need a high power sub-woofer circuit diagram for that operates on 12 volt. Both IC and Transistor types. Hope to hear from you soon. Good Day. I have built this amp just now and im testing it now for a few hours. With one word its amazing. Realy clear sound for its price. Wonderful amp for use in a normal sized room. I wasnt realy fan of gainclones till now. Hi Ahmed TDA8510 is low power just 26watts BTL amplifier. you require around 40 to 60 watts RMS power for sub woofer as the signals are felt and not heard. so power is very importand. you require a active band pass filter to take care of 20 to 120Hz information for the subwoofer amplifier ofcourse with very low distortion. hi admin, i found that the subwoofer ‘creative’ depends in its design on the ic tda8510j and mc4558cn please help me to create this circuit because i am really interested in its bass and want to create it.please help me. Hi Sokar you can have ampli speakers (say with 4 to 6 watt RMS per channel like TDA2002 etc) at each room, keep a selection system near your computer (a simple 2 pole 2 way switch for each room) either connect to signal or to ground with the switches. Since your computer output will be at line level swichitching and running them for long distance with audio quality screened cable will be possible without any drop or noise. I was wondering, can this circuit be replicated? I’m currently looking for a decent stereo hi-fi amp circuit that can have recieves a single input (from my PC) but the distributes it to several rooms. There will be buttons on the front of the unit which will activate/deactivate the music playing in each room. For example, if i wanted to have music playing in only 2 of the 5 rooms in my house, I can select only those 2 rooms but if i wanted all of them on, I don’t want to have a noticable drop in volume. SIR, I WANT ASSEMBLE THE 5.1 CHANNEL HOMETHEATRE AMPLIFIER USING IC OR MOSFET. KINDLY GIVE THE SCHEMATICS AND CIRCUIT DETAILS. THANKING YOU. I have 18v possitve & NEGTIVE supply sub woofer board. but i have to connect to may car audio amp which is working in 12 v DC supply .so I requst to you witch cicurit available for add my car audio amp .